While purchasing groceries for our Thanksgiving Day meal this past Saturday, I noticed those giant marshmallows in the baking aisle. I picked them up. No, I do not have a fireplace. No, I do not plan on camping out anytime soon. (Although I think it would be nice to do that…once!) I planned on roasting them another way. Below are photos of the experience. The STAR! 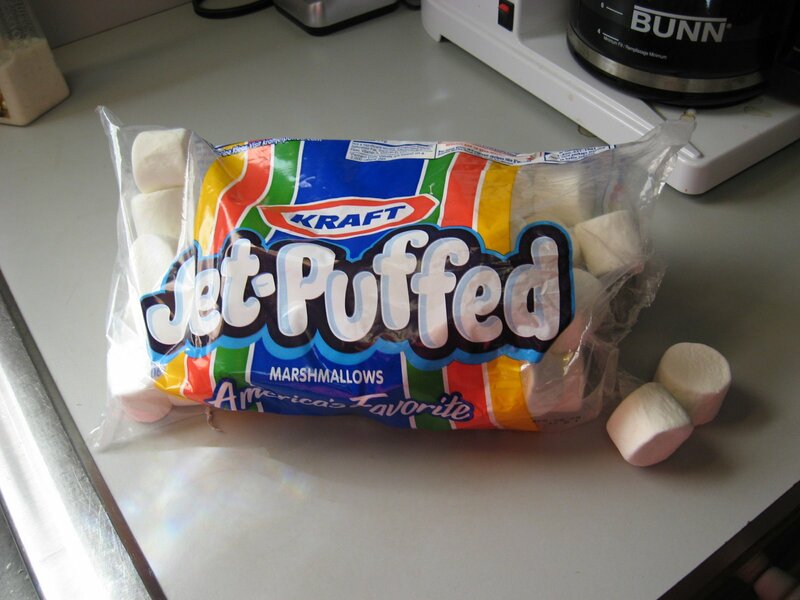 Hello, Kraft Jet-Puffed Marshmallows! How have you been? It sure has been a loooong time! You haven’t changed a bit. Yep, you probably already knew where I was going with this. You people are so smart! Anyway, as I was saying, get your strong, handy husband to unwind a wire hanger and snip it down to a small size with wire cutters. Bat your eyelashes and look helpless. (Oh no! Did I just put that on here? I hope he doesn’t read this! He’ll find out all my secrets…oh well.) Place one – or three! 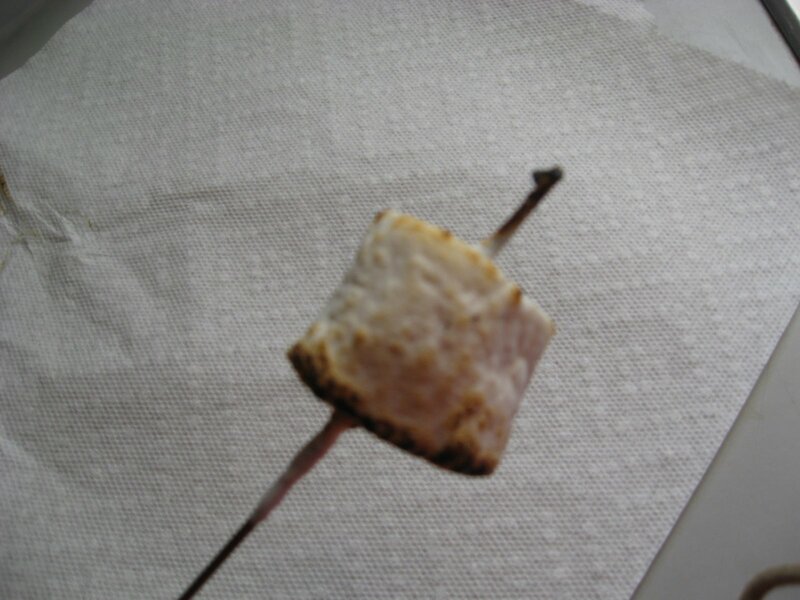 – of those beautiful jet puffed marshmallow’s onto the end of the hanger and rotate it over the flame of your gas stove. If you don’t have a gas stove, then get out your camping equipment, and hurry! It’s getting cold quickly! 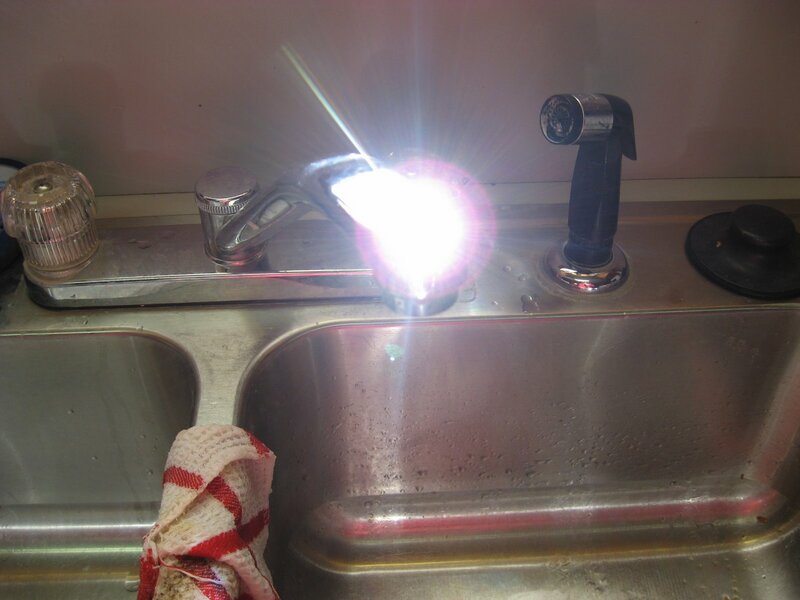 If you have a gas stove, wire hanger, and our lovely star ready, then start cookin’! Get ready for that ooey-gooey, mouth watering taste of roasted marshmallows!! When done properly, (Translation: when done the way you like them. You may like yours charred and black or maybe just barely dimpled. Whatever you like. We want you to have it your way. I’m here to please.) they are nicely browned with only slight blackening. This is what I call “Marshmallow Perfection”! Next, it’s time to clean up! Did you notice all that leftover marshmallow on the tip of your holder? Well, don’t lick it off right away, that could result in serious injury! You could let it cool and just wash it, but that’s so hum-drum. I have a more exciting method of clean up! 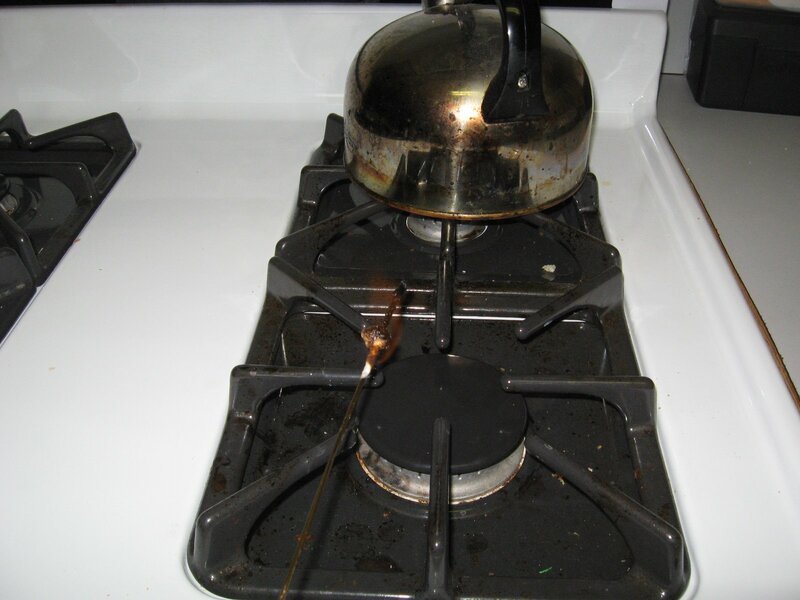 Simply hold your wire hanger (aka, marshmallow holder ) over the flame on your stove. I have no idea why the flame isn’t showing in this photo. Probably because I’m using a point-n-shoot camera, or maybe it’s because I’m a lousy photographer. Or maybe it’s both! Anyway, let it flame up for a second or two. Once you’ve held it for a few seconds (Please do not burn your house down. ), remove it and let it cool down a moment. 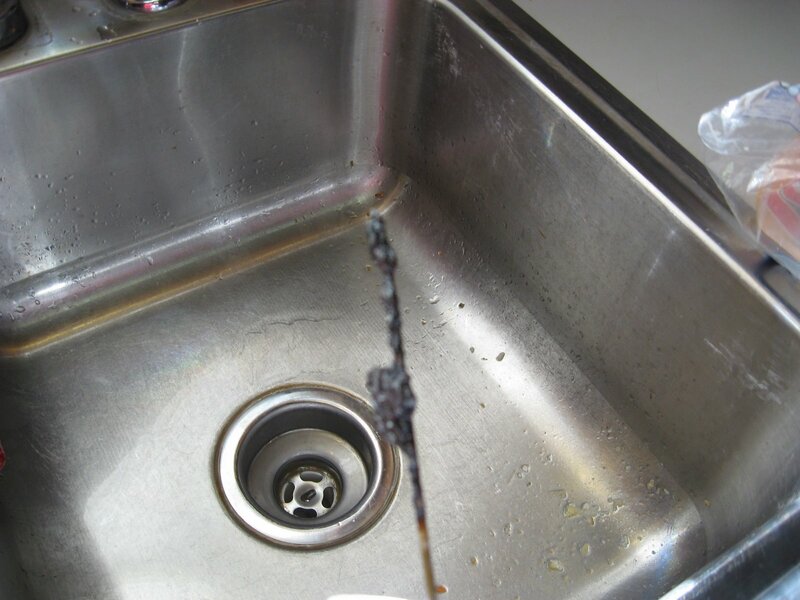 Then, take a paper towel and remove the black. *Disclaimer: Valerie is not responsible for any injuries or home damage that may result from lazy roasting practices. Do not attempt if you are under 18 years of age. Do not attempt if you are accident prone. There. Did I cover all the bases? Next, take a your SOS pad and….GASP!…I’m out of SOS pads! Okay, don’t panic if you don’t have SOS pads. 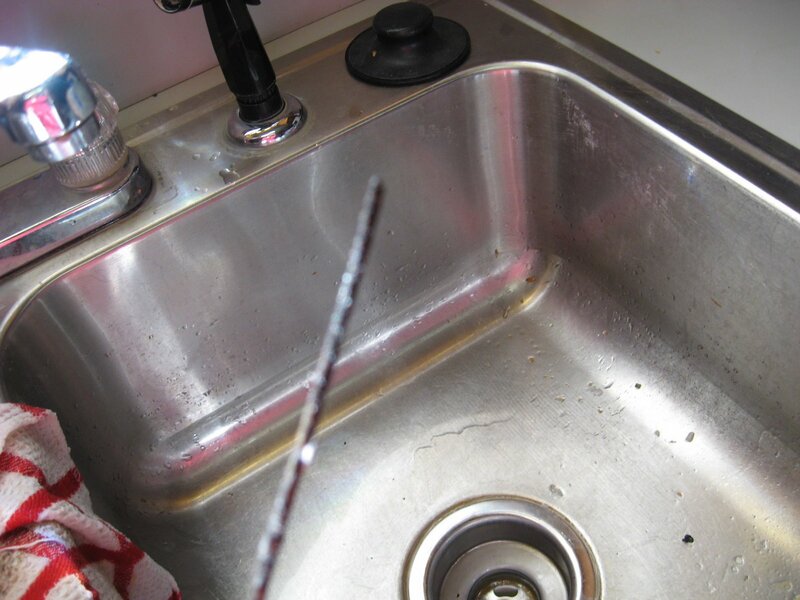 Simply use a dishcloth and scrub it a little more with some dish soap. I just wanted to throw this photo in for fun. 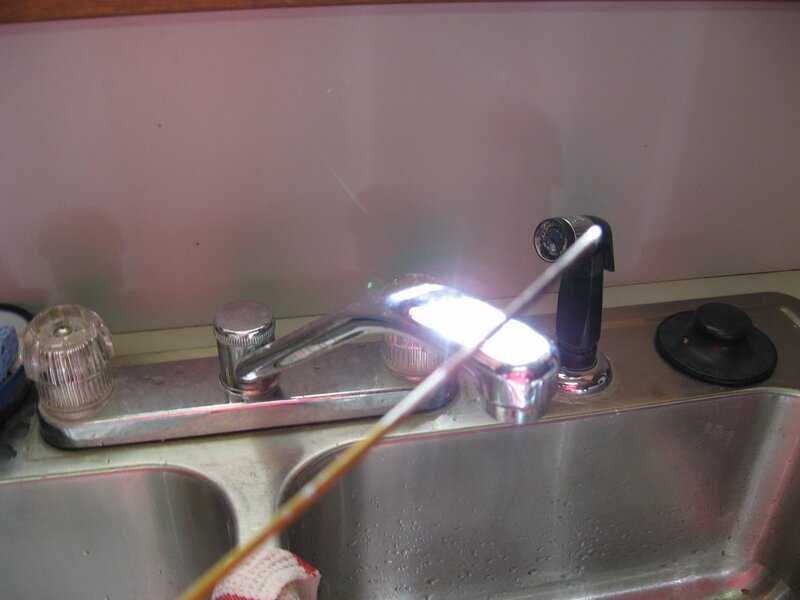 It’s just the sun reflecting on my faucet. 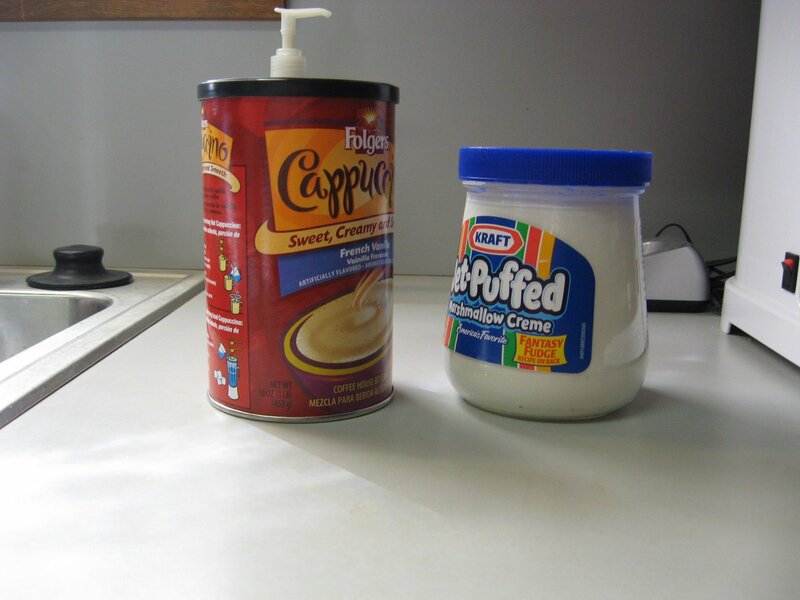 Another item I noticed when I was in the baking aisle recently, was Jet-Puffed Marshmallow’s cousin, Marshmallow Creme! At that moment, inspiration hit! 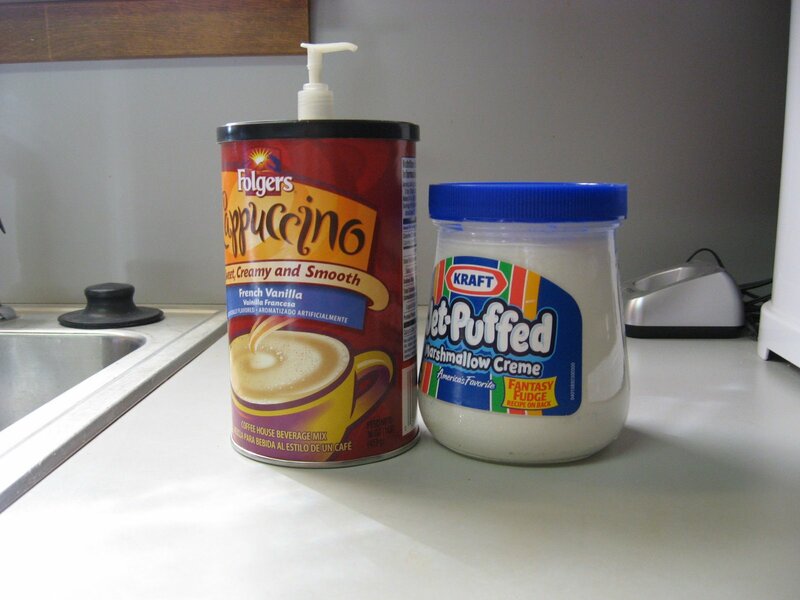 I decided to take my favorite cappuccino mix and couple it with Marshmallow creme! The result is a sensational twist on my morning routine! Oh, and go ahead and kill time by photographing inanimate objects. It’s a hoot! At first, Cappuccino would have none of it! He was so offended that I wanted to change him! He asked me, “Am I not good enough?” I explained that it had nothing to do with him, it was me! It was just me and my selfish desire to try something new. He agreed to talk it through with Creme and try to come to a compromise…for me. I was so touched! At last, they came to an agreement!! YEA! We’ve been living in harmony ever since! Now, I can go on with the rest of my day at peace with myself and the world. What? I heard that! I know I’m a little crazy and have a little too much time on my hands. You don’t need to remind me. (sniff) The fact of the matter is, when you have very little talent, you must grasp at whatever amusements you can find. This one was very cheap (free) and made me laugh. Yes, I know, I need to get out more. You don’t have to tell me that, either. Just be easy on me, people. Please? Oh, thank you! Now, go on out there and be one with your morning beverage! I craved roasted marshmallows when I was pregnant with my first. We lived in a trailer with no fireplace. I would put them on a Pampered Chef cake tester and roast mine over a candle. My husband would just shake his head in disbelief…but being pregnant he was happy that I was happy. We have a fireplace now, and I always have marshmallows on hand. Enjoy the simple things. Ok!!! 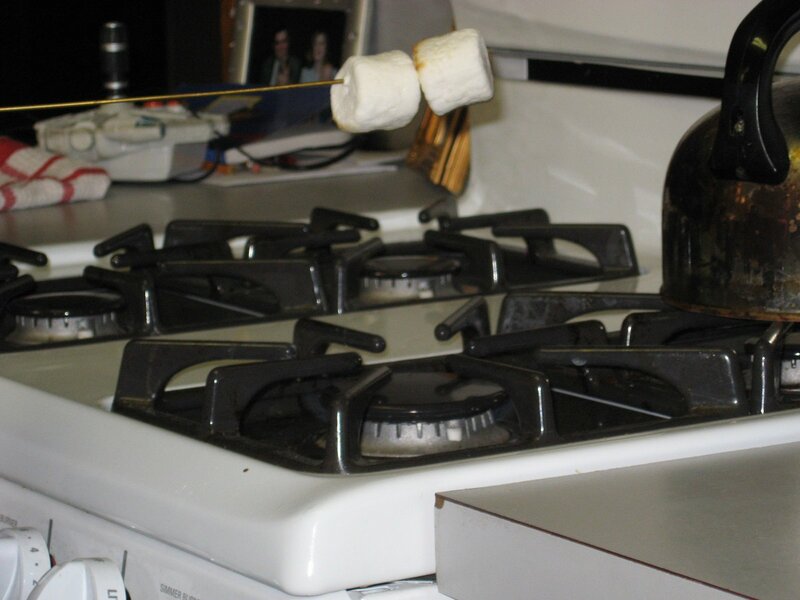 I thought my family was the only one who roasted marshmellows on the stove! Funny thing – we use forks. Glad to know that we are not the only ones who do this. oh thats sooo great! we roast marshmallows right here in the city during the summer in one of those enclosed bbq pits… my husband found an old rusty one in the garbage, brought it home and spray painted it with bbq paint and it was brandnew… we enjoy our fires in the city! BUT, this definatly works for Roasted Mallows in the winter! THANKS!